There is an increasing tendency among people to look for answers that conventional medicine has failed to address. This is why integrative medicine is trying, through the use of homeopathy, to fill in this gap by recognizing humans as an integral part of nature who have their own individual uniqueness and complexity, which explains why they respond differently to same conventional therapies. It stresses that there is a critical role of emotions, mental awareness, intent, beliefs, and nutrition in addressing the whole person, and thus will “do no harm”. Energy medicine works through subtle electrical and bio-quantum stimulation to help the body recover its ideal template and thus heal itself. The accuracy and reliability of the quantum biofeedback bio-resonance system is based on decades of research conducted in the field of bio-energetic and bio-response medicine (Electro-Dermal Screening, Voll Meters, Vega, Mora, etc). Science has shown us that the body is indeed electric; therefore electrical reactivity in the body can be measured via responses to impedance, amperage, voltage, capacitance, inductance and frequencies. This is achieved through using the QXCI (Quantum Xrroid Conscious-ness Interface) device, which measures sixteen standard electrical parameters of the body beyond just simple resistance. This makes it unique. Most standard point and probe devices (Voll Meters, Vega, etc.) only measure resistance. Trivector resonant frequencies (a mathematical calculation of the relationship between voltage, amperage and resistance) of more than 9000 substances are compared to the trivector resonant frequencies of the patient. This results in the QXCI being the best energetic medicine analysis possible. Offering over 200 biofeedback therapies in 72 modalities, it is the largest healthcare software package in the world, combining both eastern and western techniques. 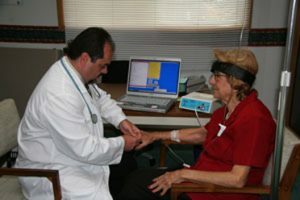 The QXCI is connected to the patient via a headband, wrist and ankle straps. It sends electromagnetic signals to the body. The scanning and therapy process is painless and non-invasive. The use of the straps (instead of probes) to locate acupuncture points as in other devices minimizes the possibility of error on the behalf of the therapist. The device was recently registered as a medical device with Health Canada. It scans the client’s body like a virus-scan on a computer, looking for everything from viruses, deficiencies, weaknesses, allergies, to abnormalities and food sensitivities. It reports on the biological reactivity and resonance in your body and indicates needs, dysfunctions and vulnerabilities both mental and physical that are affecting the energetic state of one’s body and the direction in which the body is focusing its energy. It then attempts to balance or correct these stressors with focused energetic therapies. What are the main test categories? Nutritional Deficiencies and Hormonal Imbalance. Emotional Blockages and Mental Stress, Chakras. The Top Most Reactive Issues With the Risks Profile. Skin, hair, saliva, and urine testing. Supplements and Drugs Energetic Compatibility. Electro Acupuncture, Reflexology, and Cranio- Sacral. Classical and Combination Homeopathic Remedies. Weight Management and Fat Loss. So this device provides the client and the health professional with an excellent tool to balance their energy, reduce stressors that are causing imbalances, and allowing the body to heal naturally. It could be perfectly used as a compliment to other integrative therapeutic modalities like detoxification, nutritional supplementation, homeopathy, and chelation therapy.